The Dovecote denotes a particular style of birdhouse that originally was designed to house pigeons or doves. It can be built as a free-standing structure mounted on a post, and dovecote birdhouses have also been built into the eaves and gables of other buildings. 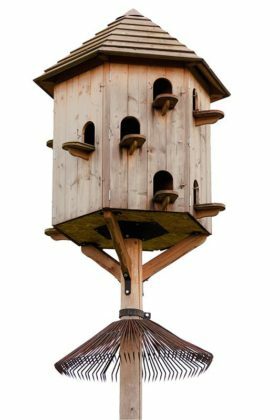 What types of Dovecote Birdhouses are available? Today, a dovecote birdhouse refers as much to the style of the birdhouse as it does to its function. There are two styles of dovecotes that are still in use. Firstly, there are freestanding dovecote birdhouses that come in many different styles and sizes. Though not as large nor as expensive as their historical counterparts, they can be designed to be extremely ornate and serve a decorative as well as utilitarian function. Secondly, there are dovecote birdhouses that are constructed to look as though they were built into your home or barn but can be hung on the outside of their walls rather than form an entrance into the building’s interior. These will definitely give your building a distinctive look and will likely become a home for some neighborhood avian inhabitants if you don’t have your own birds. The dovecote name is used for birdhouses that are meant for many species of birds. Martin houses are designed with square dovecotes in mind. Houses for various species can be obtained and built by the avid birder, and they can form the centerpiece of your outdoor landscaping. You can purchase dovecote style birdhouses that have 4, 6 or 8 walls. Round dovecotes are also available if you prefer. These houses may be partitioned so the birds have individual quarters or can be open on the inside to allow them to mingle. Based on your location and the diversity of the local avian population, you can get houses in various sizes and with an opening that is designed to appeal to certain species. The height of the mounting pole can also be a determining factor in the species that will make use of your birdhouse. The original desire for an ornate birdhouse has not totally disappeared in the modern era. While you can get a simple dovecote birdhouse with a rather plain roof you can also find extremely decorative houses as well. These are meant to be yard ornaments almost as much as they are meant to be birdhouses, and can cost over $1000. Materials used to build these commercially available houses can also vary. 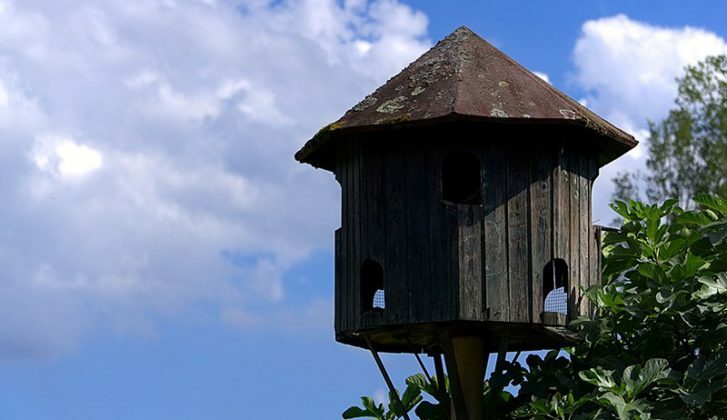 While a birdhouse made out of wood may seem like the more natural and traditional material to use, it does demand upkeep and will need to be periodically repainted to maintain its looks. Some dovecote birdhouses are constructed with vinyl siding and copper roofs and will require less maintenance over time. In the video below you can see an example of some doves flying into their dovecote and how one looks in a garden. Wall mounted dovecote birdhouses are also used by dove and pigeon enthusiasts who train their birds to return home. They can be obtained in various sizes designed to hold a certain number of birds. You would want to hang this birdhouse where it was free from overhead obstructions such as wires or tree branches to encourage your birds to return home to their roosts. More examples of detailed plans and designs for dovecotes can be found in our guide available here. Your imagination is the limiting factor if you decide to build your own dovecote birdhouse. You can construct a house of any size, with any number of walls and openings you want. Perhaps you want to have the most ornate Martin house in the neighborhood. As long as you have the budget and desire to see the project to completion, this goal is within reach. There are many sites scattered around the internet that have dovecote birdhouse plans readily available for the birder who wants to build their own. Here are plans for a simple dovecote birdhouse on the feltmagnet.com site. This house is meant to be a home for nesting bluebirds and does require the use of some cutting techniques that may not be suitable for a novice. In the above video, you can see a demonstration of a DIY multi-floored dovecote birdhouse. These plans could also be scaled in either direction for a smaller or larger house. 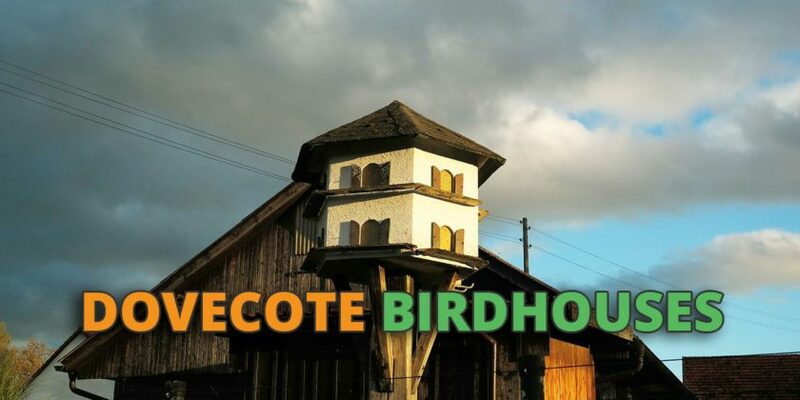 If you are a birder who enjoys the beauty of the outdoor birds in your neighborhood, a dovecote birdhouse can make an excellent addition to your property. You can design a structure that complements your home, displays your individuality, and in the process offers your avian neighbors some shelter. Sounds like a win for all involved. Doves and pigeons were historically an important food source. According to researchgate.net, as early as the 13th century the Turkish people began the practice of constructing structures to protect small birds such as doves and sparrows. In the middle ages, doves and pigeons were kept as a food source in Western Europe. Ownership of a dovecote indicated economical status and power. The owner could readily supply a food source and the birds’ secondary function was to fertilize the land. The 16th and 17th centuries saw the apex of the original dovecotes. Rich nobles in the United Kingdom and France built larger and more ornate birdhouses in a competition for status, according to atlasobscura.com. These were large buildings that could hold hundreds of birds destined for the dinner plates of their keepers. Individuality was key in their design as everyone tried to construct the ultimate dovecote birdhouse. A common feature was the inclusion of openings on multiple sides of the building to allow access by the birds. The inside could be one large chamber or separated into individual compartments suitable for breeding. Dovecotes built into the architecture of residential homes were a common sight in 18th and 19th-century architecture in the United States despite the birds not being used as a primary food source. They gave an “English” or “continental” look to buildings and were often never used for birds at all. Pigeons and doves are no longer a staple of Western European cuisine and individuals not so keen on raising their own food supplies and so the use of dovecotes has reduced. Want to know more about looking after pigeons? Then check out our guide to the secret use of pigeons during World War 2 here, our guide to training homing pigeons or even our guide to pigeon lofts.